A true celebration of the performing arts! 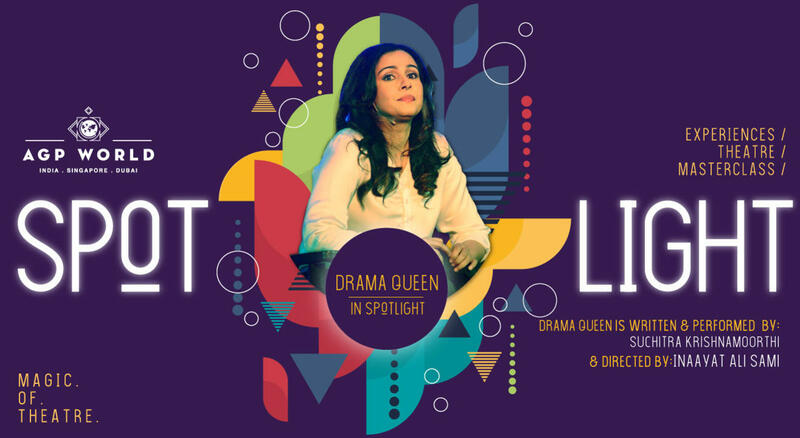 AGP World’s ‘Spotlight’ is a celebration showcasing some of the best productions from one of India’s premiere theatre production house, AGP World. Theatre buffs and first-timers alike can experience fantastic performances, cutting across comedies, thrillers, musicals and dramatic productions : all in one venue within a short span of time. This also includes up close and personal tête-à-têtes and workshops with some of the industry’s best-known names. Her successful debut Bollywood film with mega star Shah Rukh Khan, marriage with an internationally renowned film maker Shekhar Kapur, a pop album with music by Andrew Lloyd Webber, walking the red carpet at the Oscars. What more could any young girl with stars in her eyes aspire for? In her candid, wacky, madcap biography, Suchitra Krishnamoorthi takes us on a hormone-driven period of her life five years post marriage and divorce, fame and everything that a girl from a 'decent' Indian family would want. This is no longer the world of propriety that any culture would prescribe for a woman. Irrepressibly irreverent ‘Drama Queen” is an irresistibly honest biographical play that will make you laugh, cry and look at the modern Indian woman in a whole new light.